A Region 7-AAAAAA showdown took place on Monday at Peachtree Ridge, where the Norcross boys and girls combined to sweep the two matches. 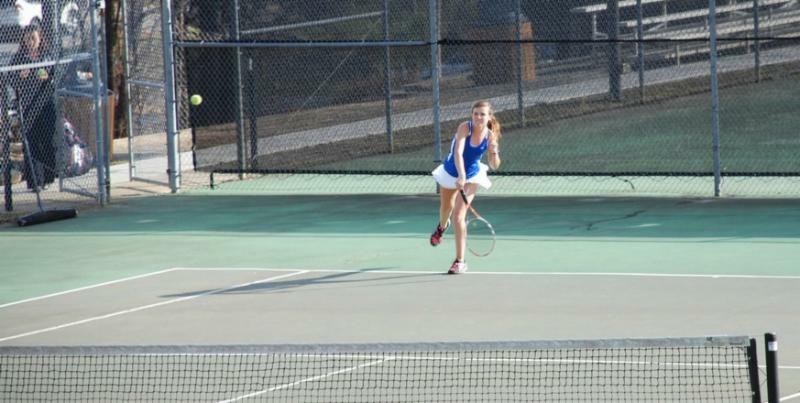 The Lady Blue Devils improved to 5-1 in region competition with a 4-1 victory. They got wins from Stacy Lackey, Amber Lackey and Jessica Lackey on the singles lines in addition to a doubles point from Kristie Teoh and Allison Schreter. Peachtree Ridge’s boys put up a fight and notched victories by singles player Taylor Foote and the doubles duo of Colin Greeff and Taylor Galloway, but Norcross prevailed at the other three spots to pull off the overall match win. Arguably the four best girls teams in Class AA hail from Region 6, where the regular-season standings continued to be sorted out when Wesleyan hosted Lovett on Tuesday. The Wolves, who lost Lovett in last year’s state quarterfinals, prevailed 4-1 after their three singles players-Sophia Strickland, Lauren Alexander and Savannah Strickland-swept their trio of matches. Wesleyan’s Katie McLaughlin and Katie Van Laeke also won at No. 2 doubles, while the Lions got on the board with a victory at the first doubles position. Defending state champion Westminster, which defeated the Lions by a narrow 3-2 margin last month in a rematch of the 2013 title match, will visit Wesleyan next Monday. An intriguing out-of-region clash pitted recent state champions against one another when Brookwood hosted Johns Creek on Tuesday. Brookwood’s boys, who won the Class AAAAA title in 2011 and did the same in Class AAAAAA last year, remained undefeated on the season with a 4-1 victory. The Broncos were led by Brandon Mills, Will George and Zach Jennings in singles, while David Brown and Will McWhirt earned an additional point in doubles. Johns Creek, whose boys and girls triumphed in Class AAAAA in 2012, won the other doubles match. Brookwood’s girls had little trouble in beating the Gladiators 5-0. Liz Slaughter, Christina Buggs and Clarissa Jolley earned singles wins for the Broncos and doubles duos of Alex Adams and Sheridan Schuster plus Natalie Nabors and Katie Berreberry also prevailed. The Holy Innocents’ boys scored victories this week over Galloway and AIS. Last Thursday, the Golden Bears defeated Pace Academy, the Bears’ first at the Knights’ expense since a region championship match back in 2008. No. 1 singles player Connor Thompson won his eight-game pro-set against Pace 8-6 and he now boasts a 55-1 career record.